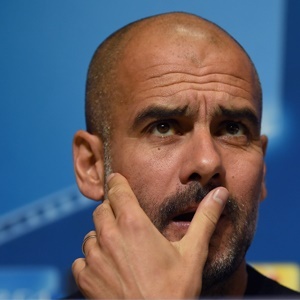 Manchester - Pep Guardiola says Manchester City are still not among the favourites to win the Champions League despite their eye-catching form in domestic and European competition. The Premier League leaders face Feyenoord on Tuesday unbeaten in 18 games in all competitions this season and with an increasing number of observers tipping them to challenge for Europe's biggest prize, which they have never won. Napoli coach Maurizio Sarri and Leicester's well-travelled boss Claude Puel are the latest respected judges to name City as the best team in Europe but Guardiola is continuing to play down expectations around his side, who have already qualified for the Champions League's last 16. "I say thank you very much to both of them," said Guardiola of the praise from his fellow managers. "For Manchester City, a team that still needs a history in Europe, it is a big win. "That doesn't mean we are favourites to win the Champions League but it's nice. It means we are doing some things very well. "But obviously people usually say the favourite teams are FC Barcelona, Bayern Munich, Real Madrid and others. But that people put us there, is a big honour. That does not mean we have done anything because we haven't." Guardiola has lost England defender John Stones for up to six weeks with captain Vincent Kompany, another centre-back, still edging his way back from injury. With 13 games to play from Tuesday until their trip to Watford on January 2, Guardiola believes the coming period will be his squad's biggest test of the season. "We don't have a big squad," he said. "It is a big pity we lost a month-and-a-half of Vincent Kompany and now John Stones. To win the titles we need all the squad, especially important players like John and Vinny. "On the other side, we have an opportunity. We have to play 12 games in a short space of time (until the end of 2017) with only three central defenders, and one of them is a risk in Vincent only just back." The City boss, whose side are eight points clear of nearest challengers Manchester United in the Premier League, said he wanted to assess how players would react and how adaptable they were. "Always when you are champions, you have to handle the big situations, the tough situations," he said. "When everyone is ready and comfortable that is not when you get credit. "We are going to see how we react in the most important moment of the season." The congested fixture list could see Guardiola turning to youth, with England Under-17s star midfielder Phil Foden tipped for first-team action in the coming weeks. Spanish midfielder Brahim Diaz, 18, and 20-year-old defender Tosin Adarabioyo have trained with the first team all season and could be pressed into action. "They are ready," said Guardiola. "Otherwise they would not be training here every day with us. In the high level, we try to help the young players, but they have to have quality to train with us. "It's not just to have fun or be gentle. They are there because they have a chance to play with us." Play on Tuesday gets underway at 21:45 SA time.